Last Tuesday had been quite remarkable. Not only that I got to bond with my friend and her grade school friend who visited (she's based in Los Angeles), I also found out about an association called KBF or Kaisahang Buhay Foundation. What was distinctive was learning about the pregnant women who are being cared by this organization. One of KBF's advocacy is providing a temporary shelter to abused pregnant women and another is foster care service to unwanted babies. The three of us paid a visit to this particular house and gave hope to these girls and women. I'll definitely be writing about that experience and we will come back there armed with spanking ways to help them more. In other news, I was expecting to have a lovely dinner with my hubs at one of Resorts World Manila's first-rate restaurants. 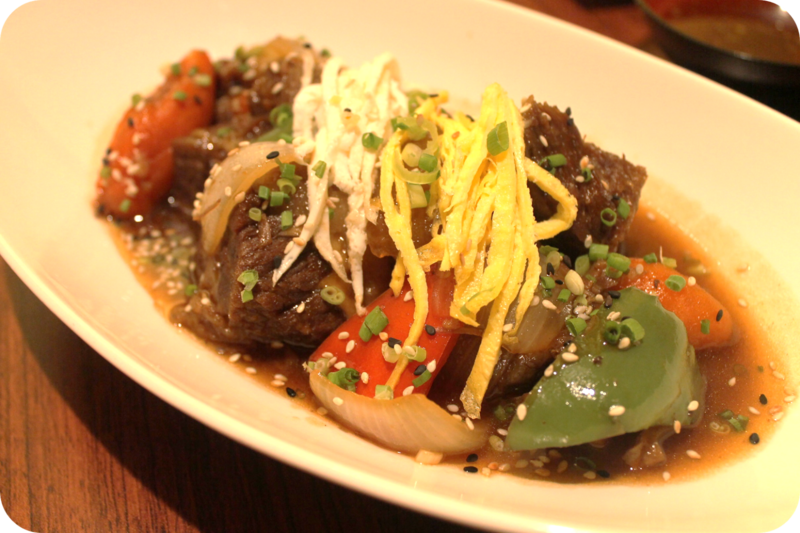 We have been meaning to get a load of Asian dishes to modify our erratic comfort food eat outs. Little did he know, we will be having admirable oriental classics at nonetheless than Ginzadon, poised at the second level of Maxim's Hotel. Resort's World Manila have perfected luxurious entertainment and they're at the helm of designing more concepts to cater to different clients, whether local metro dwellers or foreigners. They have proven to top the saying that there is more to life than just working hard, most of the time, it really pays to reward yourself with memorable pleasures, and RWM have it all roofed in one convenient location. Where else can you enjoy five-star hotel stay-cations, watch breath-taking theater shows, maybe dine after an array of cuisines and watch a new movie without spending on gas, and oh try your luck on the casino. If you think they have exhausted everything at their only Manila branch, (yet) you are wrong. According to the marketing team of RWM, they are still on the verge of adding a 5,000-seat convention center with function rooms in 2014, new hotels Hilton and Sheraton in 2016 and more restaurants and facilities to be added plus not to mention their biggest project the Resorts World Bayshore along Manila Bay. I guess if being the best in fusing different cultures and different kinds of having fun, we can simply expect one thing from RWM, if they have aimed to bring two worlds in one dining- the best! There I said it, Ginzadon, does not only serve authentic Japanese cuisine but also favorite Korean dishes. Though sounding like Japanese, the restaurant's name actually was derived from, well, both countries. The Japanese word "Ginza" means an upscale district in Tokyo, while "don" simply means money in Korean. It was my first time here and I was very delighted so I will share more photos of what to look forward to. 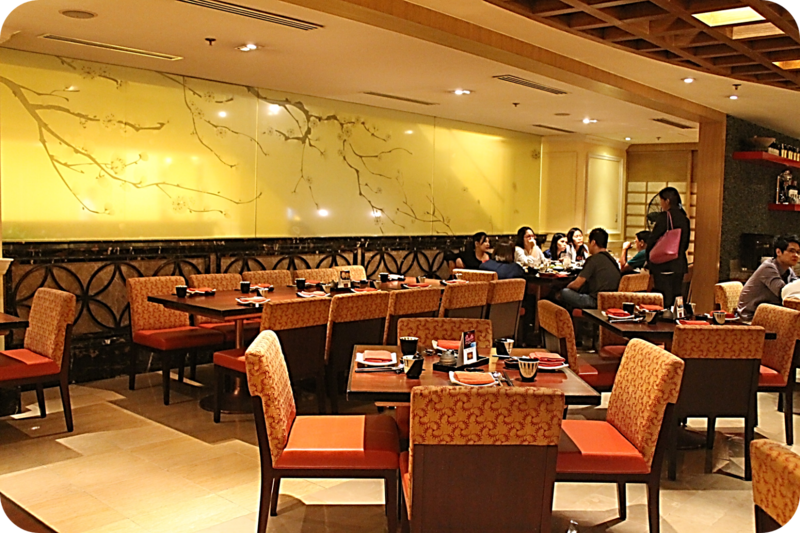 Compared to Passion, a neighboring fine-dining resto which is expansive and have been a great venues for family and corporate events, Ginzadon is rather intimate with a dining capacity of 65 to 70 only, making it ideal for small family gatherings and company meetings. 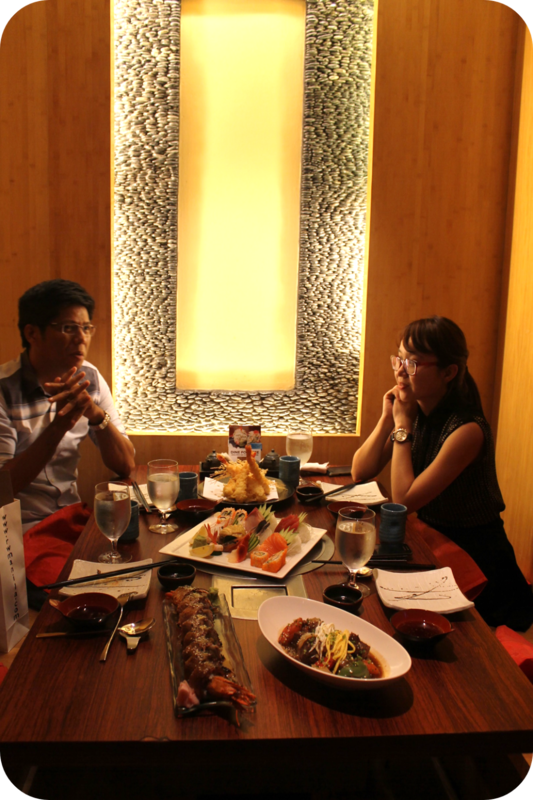 Just like other Japanese restaurants, minimalism is their key design, wooden, earthy tones with splashes of reds. I particularly fancy the glassed wall with cherry blossom etchings. 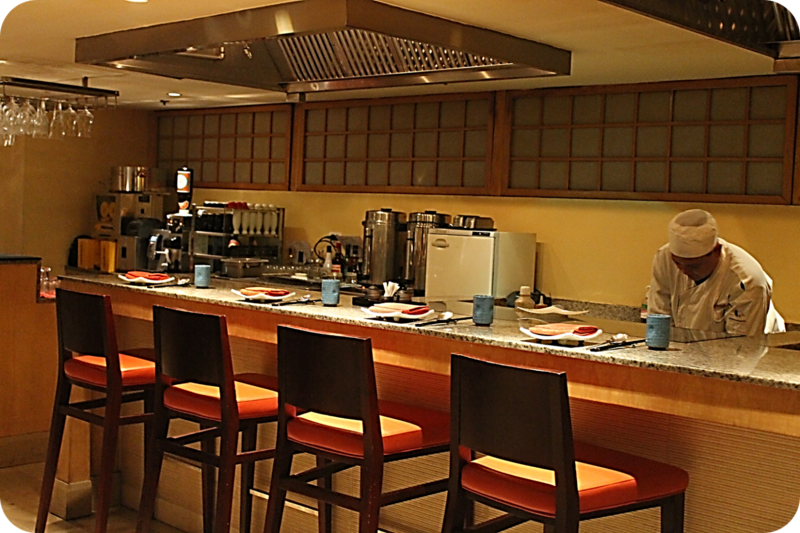 On the foreground, from where we came in, are three separate bars- the sushi, the sake and yakitori. Before I could even approach the sake bar, I was lured to the bar on my right, with the commanding aroma of the meats being grilled. I got even hungrier. 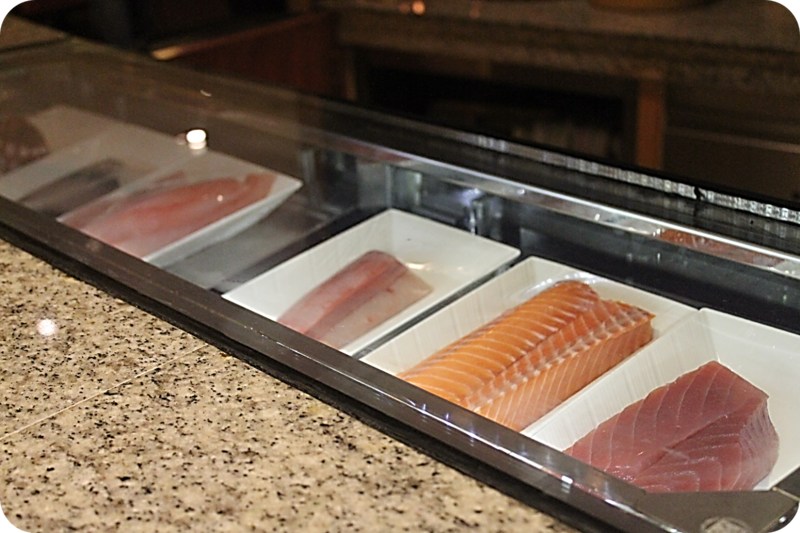 On the other side which is the sushi and teriyaki bar, are these freshly sliced fish meat. 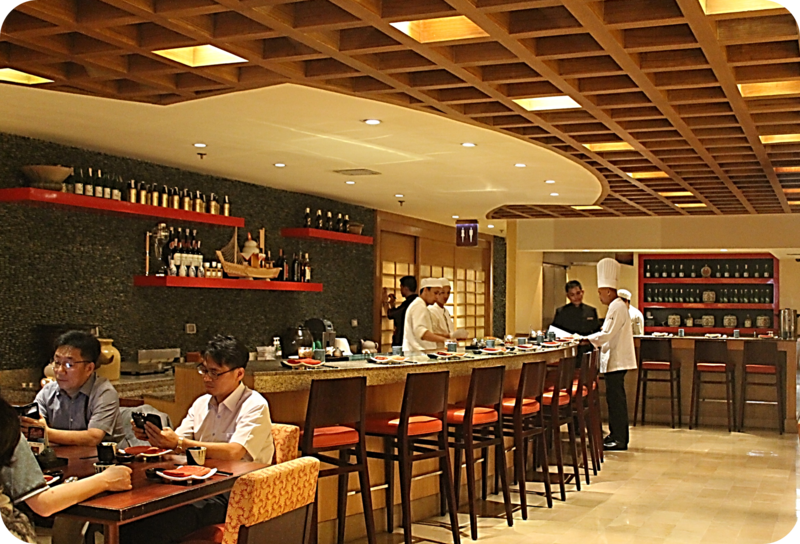 You will be amazed that Ginzadon's kitchen have captured the essence of Japanese cuisine by taking the best of what the island nation has to offer in terms of flavor and bringing it all together here. You will definitely feel that, once the menu is flipped open. I was just as blessed to have met Chef Tony, or Chef Antonio Ablay in serious terms, who shyly approached me with a greeting and mentioning that he will have me try his favorite creations. Garbed in his sauce-splattered chef clothes, he was anxious to pose in front of my camera but was very accommodating and cheery when asked. According to him, "In Japan, there's a difference in flavor if you go to Tokyo, which is in the north, or if you go to Osaka, which is in the south. In the north, they tend to be heavy on salt, while in the south they prefer less. 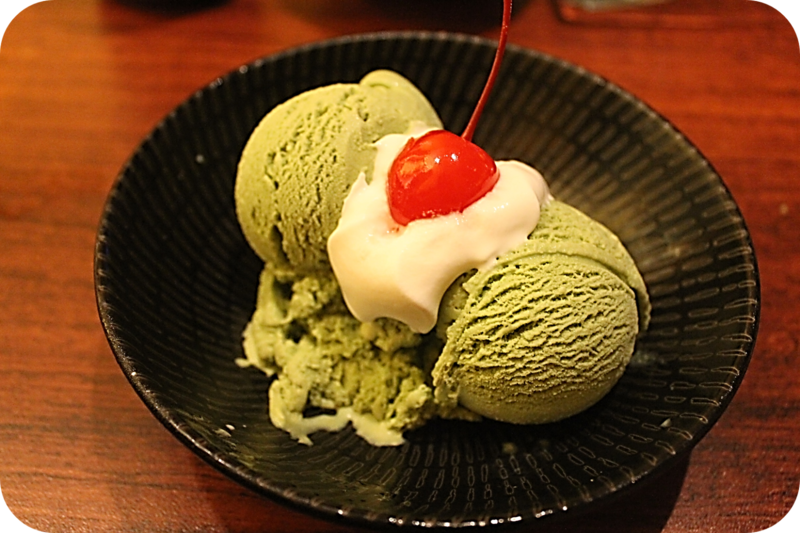 Here at Ginzadon, I let the flavors of the north and south meet in the middle." Here begins hub's and I's gustatory indulgence with twice the oriental flair. 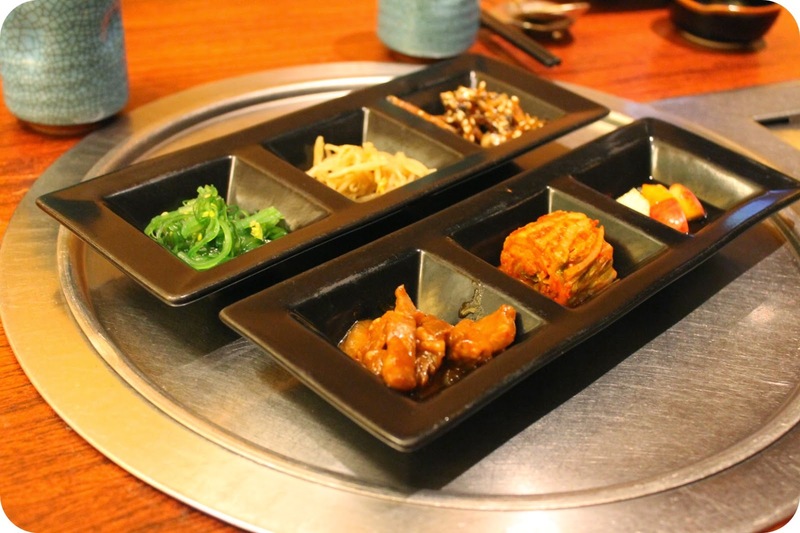 I was busy taking photos and talking to the chefs behind the three bars, while these sets of banchan came ahead of me. 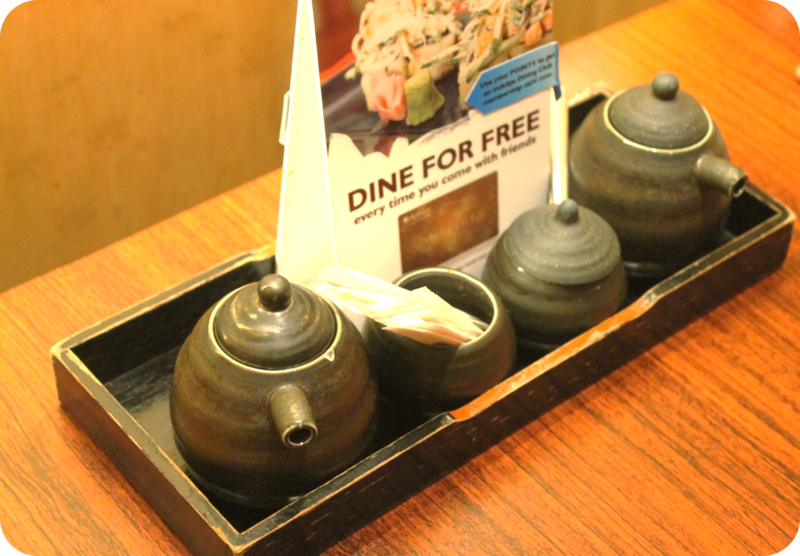 These are unlimited, complimentary side dishes or appetizers which you can nibble on while waiting for your order. Honestly, it took us a while to decide what we want, they all looked heavenly on the menu. The set we had included kimchi, Myulchi Bokkeum or stir-fried anchovies (which I almost finished just because...), pickled this and that, and more. 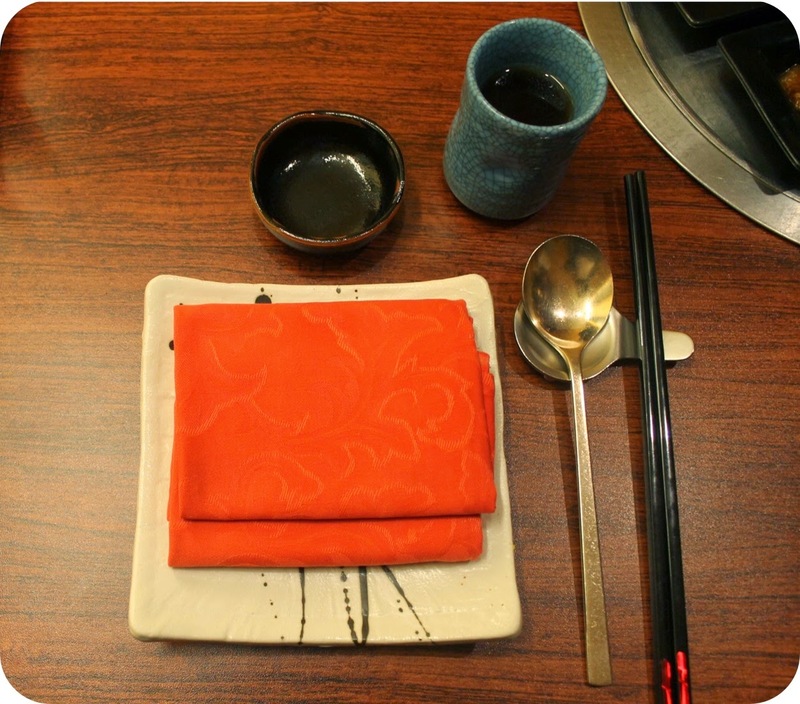 Soy sauce and what not already prepped on the table, serves both as an adornment. The Ebi Tempura was first to reach our table. What set's this tempura apart from the others, is that it’s extremely light and not oily at all, also the size is larger than the others. There is that delicate balance that really comes across in their dishes. The seafood tempura I tried was crispy on the outside but soft inside. And the vegetable tempura dishes brought out the flavor so well I was amazed that familiar everyday vegetables could taste so good. Next is the assorted Sashimi Moriawase set or the Special Sashimi Platter, which came with a selection of fresh and imported fresh sashimi and a sampling of uni beautifully placed in the middle. The mixed set has a variety of seafood that I’m not that familiar with, as well as elegantly cut salmon, tuna, and mackerel. Their sashimi platter indeed has the finest cuts of delicious raw fish (at least those fish that are in my food-cabulary). I successfully tried one of each from this platter, though I hope my love for these wasn't that obvious, hehe. 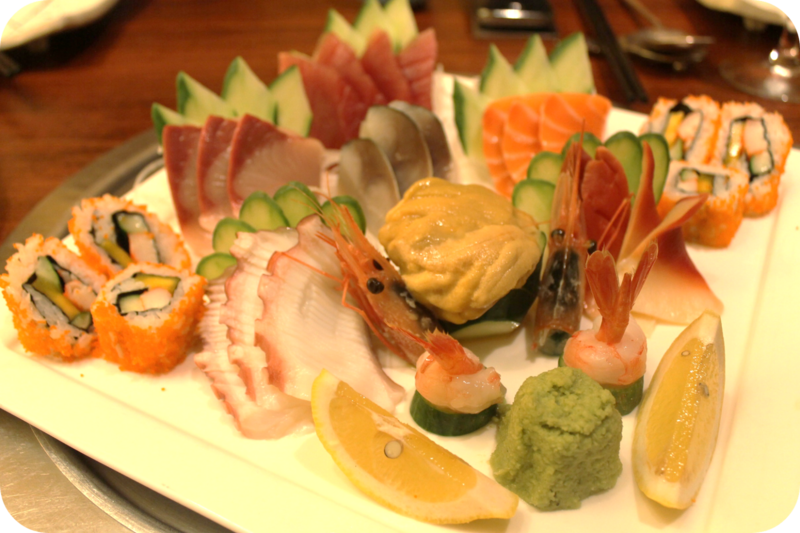 Sushi Platters' price starts from P 675 to P 1000 and P 95 to P 400 for the specific sushi orders. You can have a divine platter with assortment of Sashimi with a price of P 1,100 to P 1,700 while an order of one variety starts with a price of P 115. I was not yet done with my wows, when this long, long glass rectangular plate came. Chef Tony's signature dish - The Yulonagi Maki, Ginzadon's take on the Dragon Sushi Roll. It's a California Roll made more appealing by topping it with "unagi" or eel prepared "Kabayaki style." 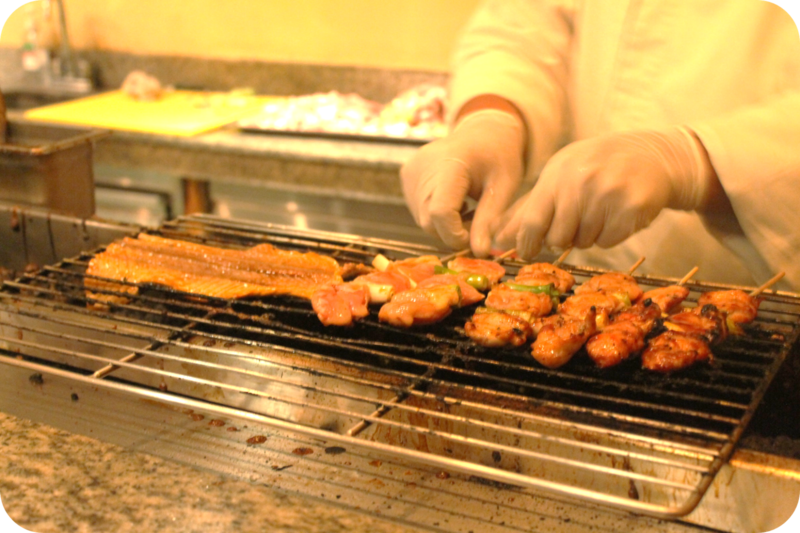 Kabayaki is a culinary skill where the eel and also other fish, is opened up like a butterfly, is filleted, and grilled with sweet soy based sauce. 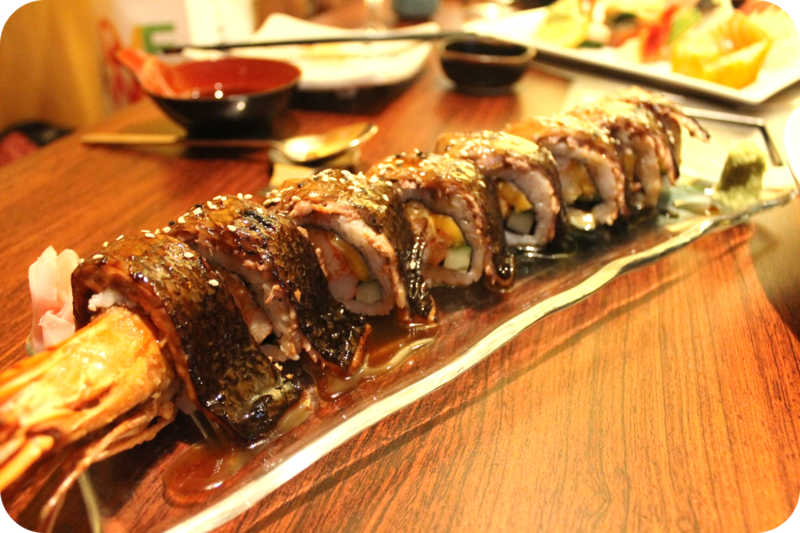 So now, I'm wondering how to satisfy my strong craving for the juicy and smoky eel dish + maki. Thus, I have more excuses to come back here at Ginzadon. Then came a meager large oblongated bowl filled with savory, short-ribby goodness, drenched in a sweet, soy broth with hearty vegetables, topped with sliced fried eggs for a quirky manner. This is Gal Bi Jim. 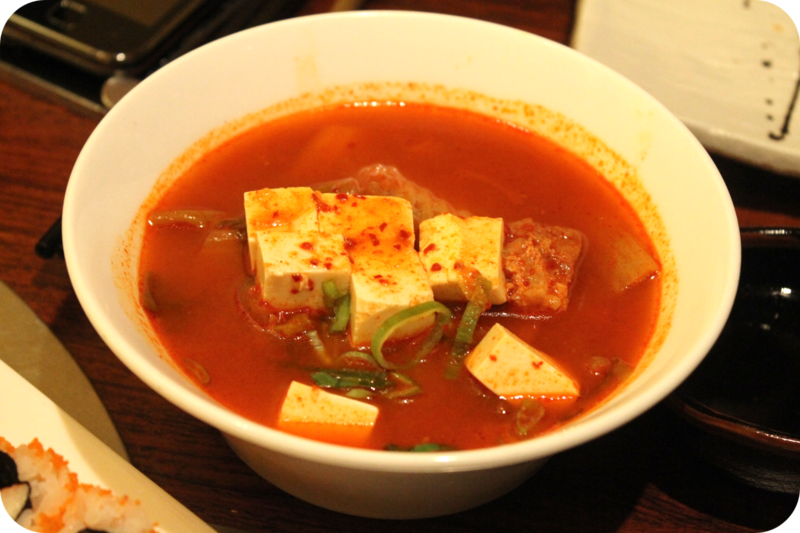 It's one of the best-seller among their Korean dish list. Slightly resembling Korea Garden's Beef Stew, Gal Bi Jim is definitely comforting, with its super tender and moist meat, perfect for those moments when life totally needs a pause button. This is best paired with Yamameshi or Gohan. Our meal were hosted by two gorgeous ladies and they had a bowl each of Kim Chi Jji Gae (Kim chi stew), while we just had Miso Soup. See how huge the servings are. 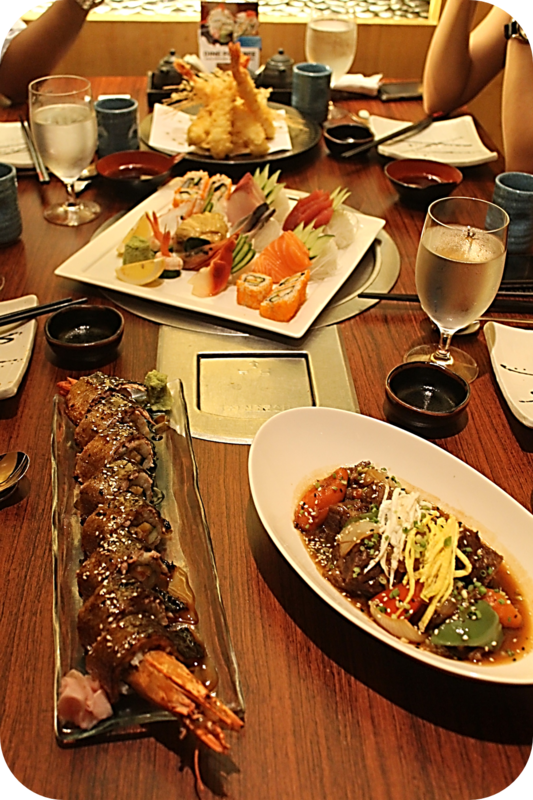 An order of each dish may serve up to 4 people. Ain't that lavish, else how would you describe this feast? How then can you end this? Of course, with a sublime sweet course. You can choose from coffee jelly, to mixed fruit platter, but my best suggestions are their frozen treats. 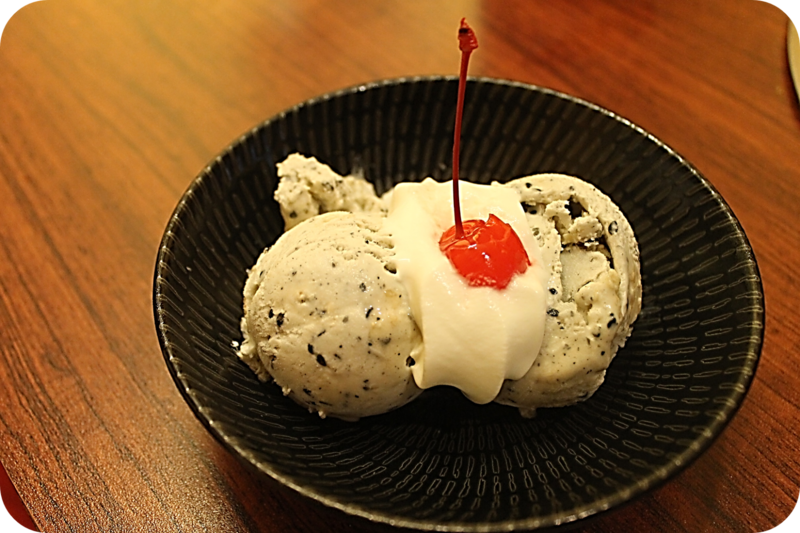 We were served with two of their house-made ice-creams, Black Sesame Ice Cream for hubs, while Green Tea, known to their regular diners as Nuk Cha, for me. All of these started and ended with a complimentary bottomless hot Japanese Green Tea. Now these all can spell healthy, right? 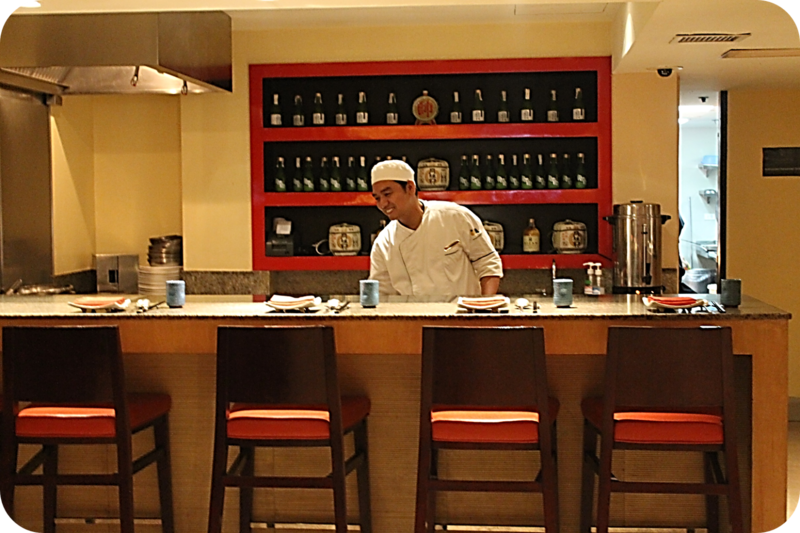 They too have soju, sake and a wide variety of beers and other beverages to compliment your hearty Asian meals. Everything we had that evening was nothing short of great. We went home with happy tummies, enough not to get a midnight snack. With that Ginzadon have won new customers in us. This will be a great news for my kids as well, we won't have to travel far to visit their favorite Japanese resto in Nuvali. When we dined there, a lot of the clients are foreigners and the ambiance seemed so formal so I was too shy to take a photo. I'm tempted by their maki but its so pricey. Worth it? I've been craving for Japanese lately! 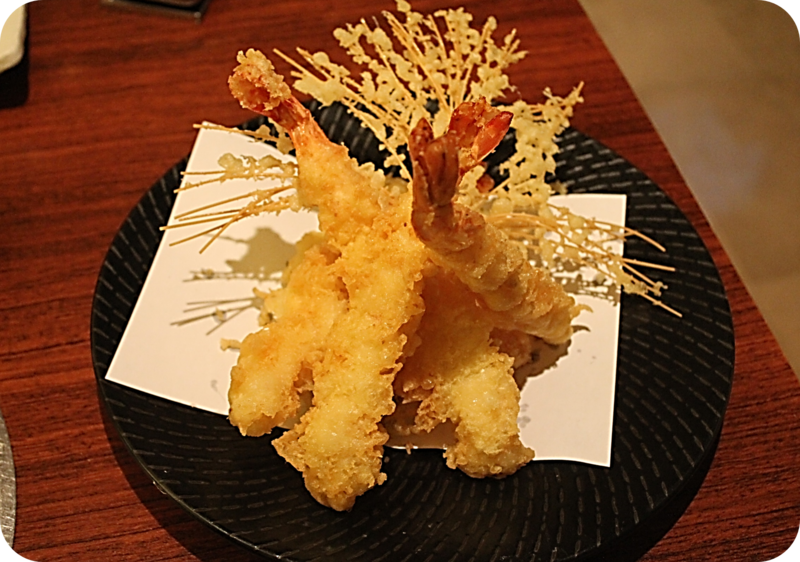 The ebi tempura looks so good! What a great post, so yummy, LOL! Your photos are great and make the dishes look like works of art! The food looks so delicious. Spend me maybe? Oh, they say that you are not supposed to cut the sushi. You need to eat it whole because the chef painstakingly made it that way so that you can experience the marriage of flavors. Anyway, this is quite a gastronomic feast! Thanks to this exhaustive post! The restaurant looks great. But I am interested to know more about the women's shelter! Reading your post made me feel that they are a cut above the rest of the Japanese Restaurant. The interior of the restaurant looks fabulous! And the food as well looks amazingly delicious! Sweet dinner for 2? Is the pricing worth you to go a second time with the quality of the food you've tried? It's not a dinner for two. We were on a meeting with two RWM personnel. All four of us weren't able to finish everything, for the serving is huge and would be good for up to four people. Pricing is just about right for the top notch (international) quality of each of the dishes. Though price is a bit steep, I would still and will be coming back to try other dishes. What a wonderful occasion to be out having such a fine dining experience. I love the setting and the food selections. Bihira lang ako makakain ng beef kaya yan yung hinahanap ko when eating outside.